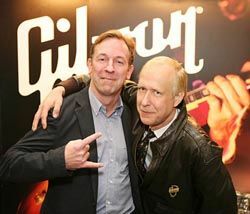 Anders Fauerskov, CEO of TC Group (right) and Henry Juszkiewicz, chairman and CEO of Gibson Guitar.RISSKOV, DENMARK-As this edition of SCN went to press, the merger between TC Group and Gibson Guitar was due to be completed. The announcement that the two companies were to merge was made in January at the NAMM 2008 show in Anaheim, CA, and most industry speculation since then has surrounded its possible implications for the MI business. "This merger will revolutionize the music industry for many years to come," Henry Juszkiewicz, chairman and CEO of Gibson Guitar, was quoted as saying. "The synergy between the two companies will allow us an enormous advantage in the development of new audio technologies and brings together two of the world's most powerful brands." What is not clear is whether these "new audio technologies" will include Gibson's MaGiC audio data networking protocol, which was first unveiled in the early part of this decade and was said to have been one of Juszkiewicz's own personal pet projects, but which has not seen any public development since 2003. Certainly, the TC Group brings a huge amount of DSP and programming expertise to the table, notably within the TC Electronic and TC-Helicon business units. And the Danish-based holding company also offers synergistic product ranges, which Gibson, despite its huge roster of MI brands, does not have on its own. TC Group's Tannoy is one of the world's foremost brands in the field of installed loudspeakers, while the Lab.gruppen business unit, based in Sweden, recently diversified into the integration sector with its C-Series power amplifier range, unveiled in 2006. Financial terms of the deal have not been disclosed, but Anders Fauerskov, CEO of TC Group, will remain based in Europe and serve as COO of the merged company. "The possibilities ahead are very exciting for us," Fauerskov said. "This merger will create exciting new opportunities for all employees within TC Group and Gibson, and in particular, fantastic new tools for our markets and customers."